Many things going on in the house today. I say "house" because I pretty much have a project going on in every room! Currently, the kitchen table is set up for photography...and photography means pulling out props for "lifestyle" shots. When you are photographing 20 + samples, that's a lot of different vintage pieces, backgrounds, and linens. Just waiting for some afternoon natural light today and I will be done! The CHA aftermath continues in the living room. All samples have been organized into their respective boxes for shipment back to the designers on Friday. 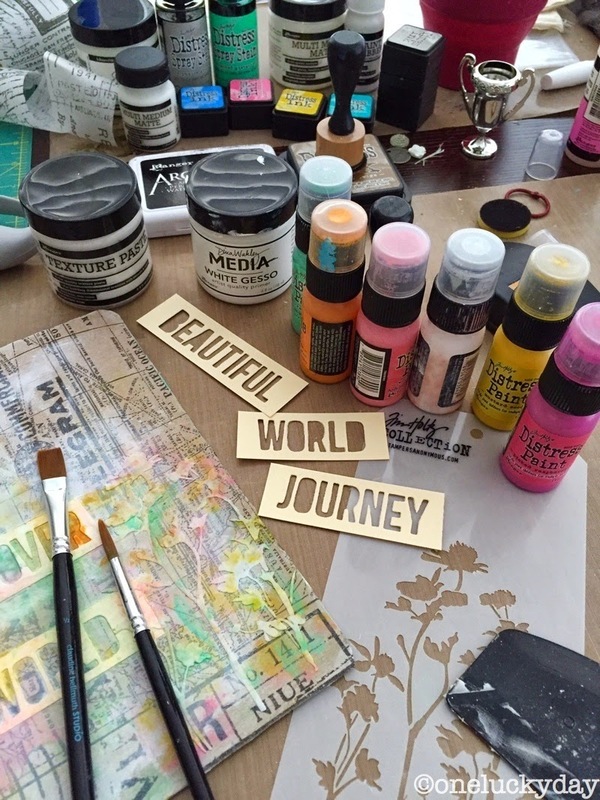 And back in the craft room, my work desk is a mess - still working out some class ideas for my spring classes. Gotta use a little Cracked Pistachio! Anyway, as you can see there is always a lot going on and that is GOOD. Keeps me busy and lucky for me, I'm married to someone who does not give a care if there is a photography studio set up on the kitchen table or a pile of boxes in the middle of the living room. If fact it probably bothers me more than it bothers him. No worry though, it's all in a days work! 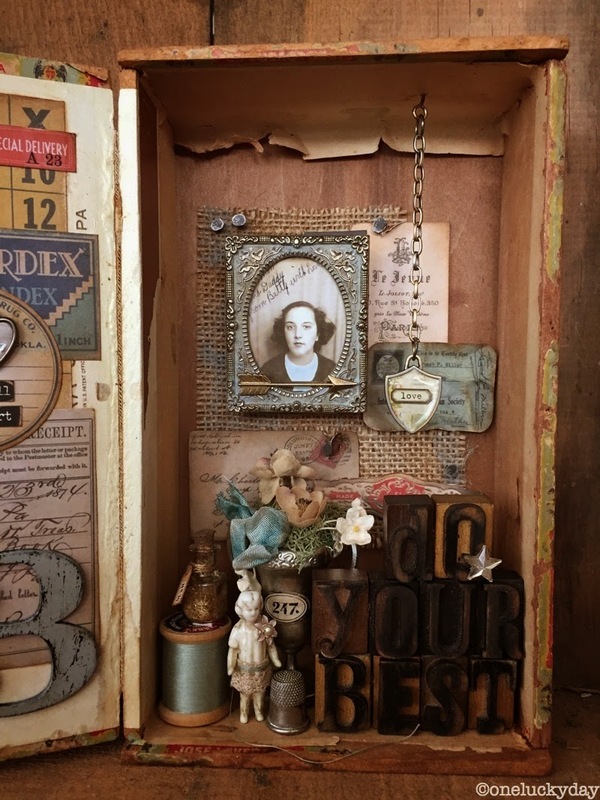 I'm sharing one of my CHA projects - "Do your Best" cigar box. 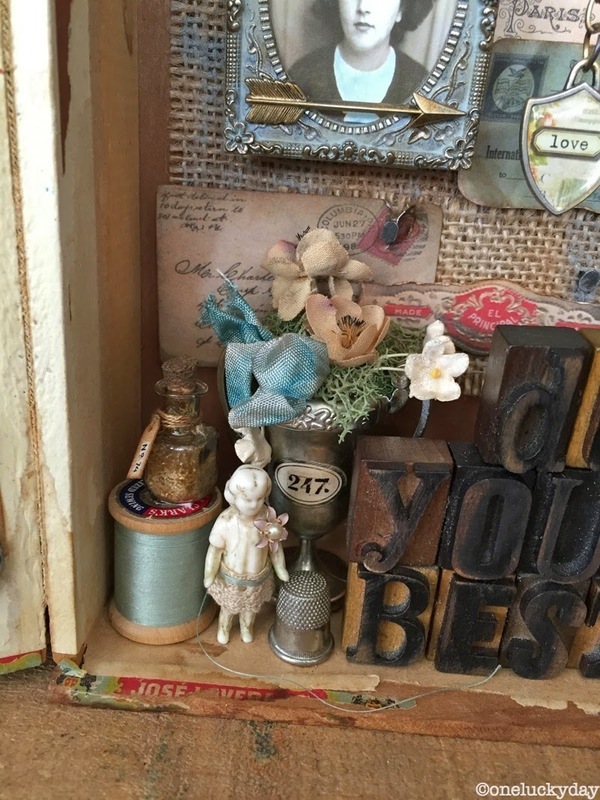 I use a vintage cigar box I picked up in TX last fall to house a assemblage of letterpress, thread, a thimble, a new trophy cup and a Salvaged Doll. I did not change the front of the box because the graphic was just too good to cover up. 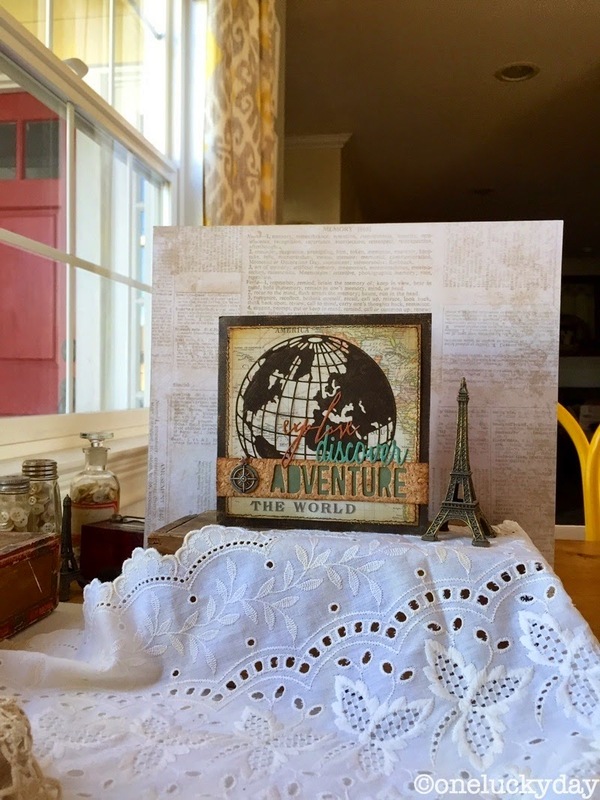 On the inside, I used burlap from the new Textured Surfaces and Emporium Ephemera for the background. And yes, you are seeing that right...I used tack nails to secure the burlap to the wood box. The Foundry Frame has been painted with Weathered Wood and Brushed Corduroy Distress Paint and Alcohol Inked. A small Adornments Arrow added (gold alcohol ink). The photo is from the new Photobooth set. I also used a Screw Eye and some chain to hang the Shield Charm from the top of the box. I used the new Trimmings- Lace to add a skirt to the Salvaged Doll. The metal flower came from a vintage earring that I clipped off. The little bottle is one of the new Tiny Vials that has been filled with glitter. In the background you can see the trophy cup that I alcohol inked with silver (to cut back on the shine) and then burnished with very fine steel wool. Hope you enjoyed today's project. I sure had a great time making it. Now it's back to doing the things that need to get done today so I can at least get the kitchen table cleaned off for dinner tonight! I am teaching in Iowa and CA in March! I love the cigar box - so many wonderful elements, I see a different piece every time I look! I am always thankful that I have a large house - I take over rather a lot of rooms too. Obviously the sign of a busy crafter ! That cigar box is amazing! I love how you dressed up your Frozen Charlotte. WOW! I love it all! just gorgeous Paula! TFS! Thanks for sharing a day in your life Paula. Your cigar box looks amazing! I'm putting some serious thought into driving from MN to IA for your classes. Sounds like a fun weekend! Your cigar box looks amazing, I could keep looking at it for ever! This is fantastic! What a great idea to use the star to make a Q! My favorite thing to alter!! I love this!! It's so amazing ... down to smallest details ... the dolls dress and corsage ... OMG ! very cool!!! I love all the fun details. I remember those tack nails from the Peace on Earth/Angel Wings assemblage you made a few years ago. Genius then, genius now! I like how you left the raised portions on the frame silver and how the lovely faded blue color is carried throughout the piece. Thanks to your great photos, I can now better appreciate the scale of the Salvaged Doll since she's placed next to a spool of thread and thimble (I do wish the fractured ones were still available). A truly inspirational project, thanks for finding the time to share it with us. I love this! The new salvage dolls are awesome. Makes me want to do something with my cigar boxes. I'd like to solve, please. 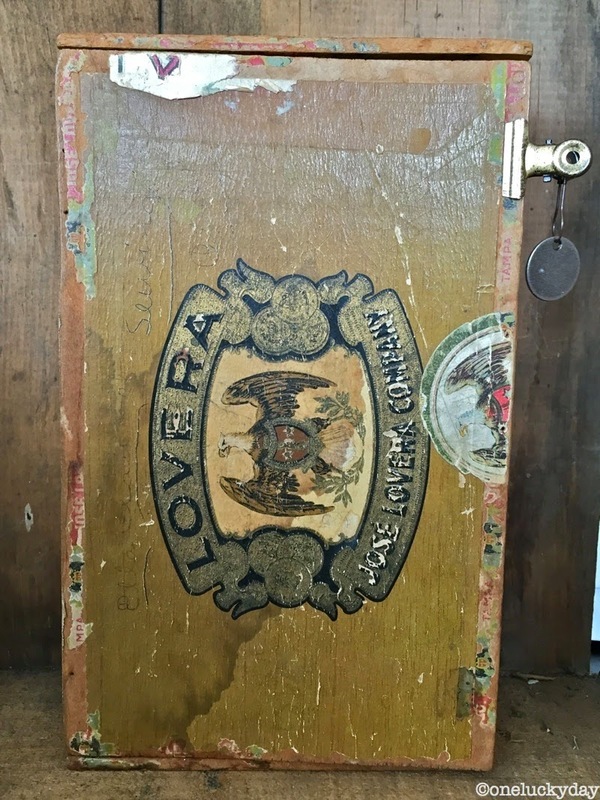 Fabulous interpretation of a cigar box makeover! Lovely cigar box (and use of the star!). Love the stacked suitcases in your living room - we have nearly the same rug in our living room as you have in yours. I always love the little vignettes you make, this one is wonderful, too. LOVE this Paula!! Love all the bits and bobs in there...see something new every time! LOVE that someone else has stuff all over there house too...thank goodness for supportive husbands and families!!! All the projects in the booth were gorgeous!!! J'adore ! J'adoooooore ! Wonderful work ! Paula - We are very excited that you are teaching at Memory Bound!! It is beautiful Paula!! Love all the details. I can't wait to play with all the new products. Have a few of these boxes. Thanks again for great ideas. Would love to follow you.